An appropriate set of Change Parts, determined by the end being tested and the test performed, are installed in the unit and the sample clamped in place. 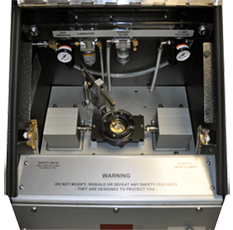 When buckle testing or tab blowout testing, a test sequence is initiated and the end is pressurized at a specified rate until it fails; the pressure at which the end failed is indicated on the front-panel mounted digital display. When vent testing, a test sequence is initiated and the end is pressurized to a specified pressure. 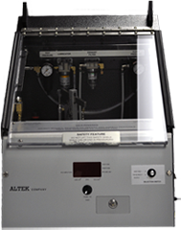 The pressure is held momentarily, then the tab is opened automatically via the fixture located in the test area.